I guided my old client and friend, Shaun Daniels from Wimberly yesterday. The wind was low enough to allow for "glassy" conditions early, so we started on the west side where I'd been finding tailing pods early in the day. We hadn't even reached the area when we moved a school of reds and several pods away from the intruding boat. So I shut down immediately and let the fish settle down. Within a couple of minutes, there were pods tailing as close as 75 feet from the boat. Of course, we weren't ready, but once I was up on the platform and Shaun was on the deck, we had some serious choices to make; that is, which of six or eight pods would we pole toward. 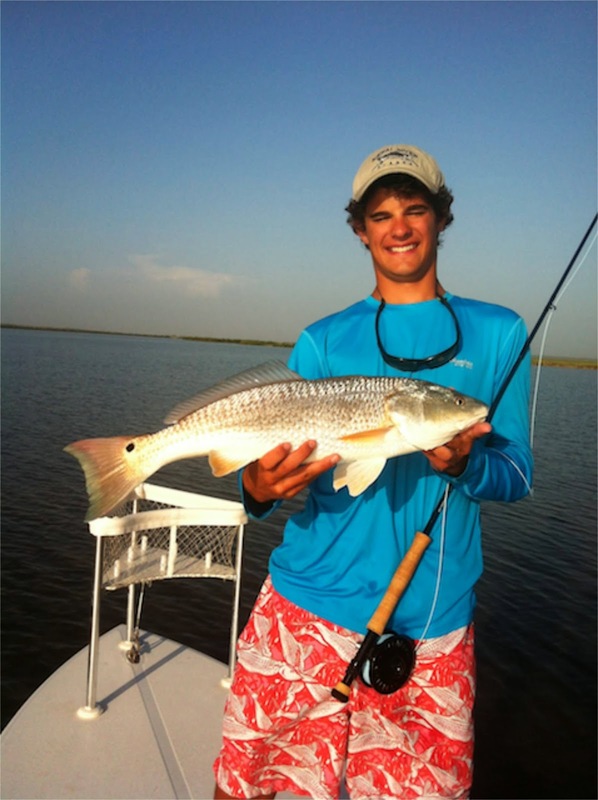 The fish were larger than usual, so the big tails waved in slow-motion above the sheen of the calm water. But they weren't easy! Indeed, Shaun would get no more than one cast to the tails before they would slowly move away, and set up business 100 yards away. So it was especially challenging for Shaun, who had been practicing his cast every day on the football field near his house, but hadn't casted to a live fish in a year or so. But there were no complaints from him. You can always tell a true angler, because he's always looking at what he can do better, rather than how the fish or mother nature could have made life easier for him. But one reason the reds were so sensitive is because of the full moon the night before. Even though reds will feed at daybreak after a full moon, they are exceedingly sensitive and will spook at the sound of a pin drop for the first several hours of the day. I have observed this phenomenon for decades. 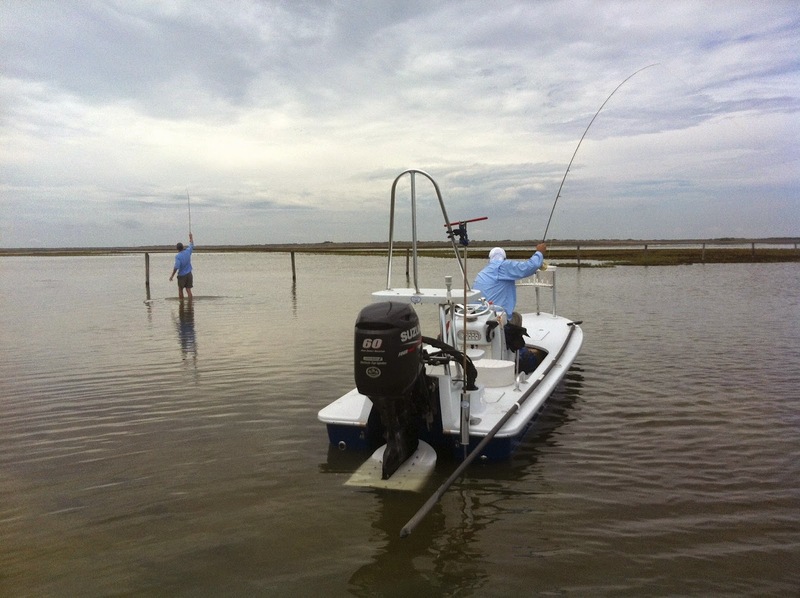 Only a precision, unobtrusive cast will draw a strike, and that's hard to orchestrate in dead calm conditions. We went to another venue north of the mouth of the Arroyo, and poled a shoreline that doesn't see many boats, given its remoteness. Almost immediately, we saw a huge push in our direction. "Is that a red?" Shaun asked. I was a bit incredulous, too, because as we got closer, we could see that it was well over 30 inches, perhaps 32. And yes, it was a red all right. Shaun made a credible cast to it as it passed us, turning and shining in the morning sun without ever seeing us--or the fly, as it turned out. Minutes later, we had another close encounter with another oversized red (above 28 inches). This time, the big fish fled before Shaun could get the fly to it. And then, once again, as if we were dreaming, we saw a wake coming from 40 yards away. This time, a 27-28" trout swam right up to us, but clearly saw the boat as she sauntered by. Shaun's cast was close, but she wasn't in the mood for accommodating us. We headed for the sand earlier than usual, about 9:30, and opted to wade. We spotted several reds feeding upwind, but they were especially sensitive and spotted us beyond Shaun's (or anyone's) casting range. Then we headed up toward the East Cut, and fished for a couple of hours under a cloudless sky. 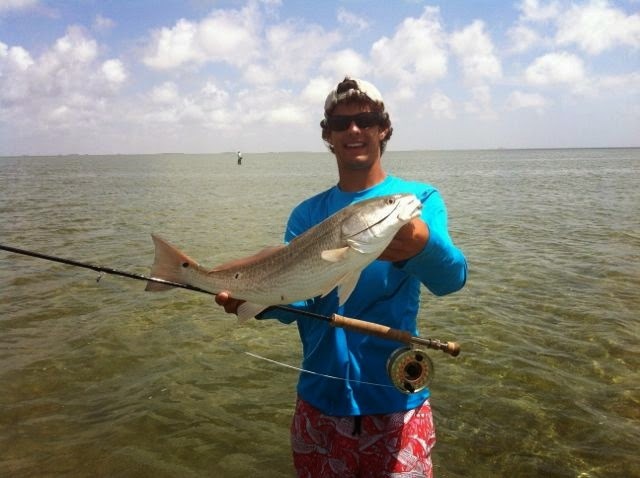 It looks like the Bahamas in that are, and Shaun had numerous shots at reds feeding upwind. 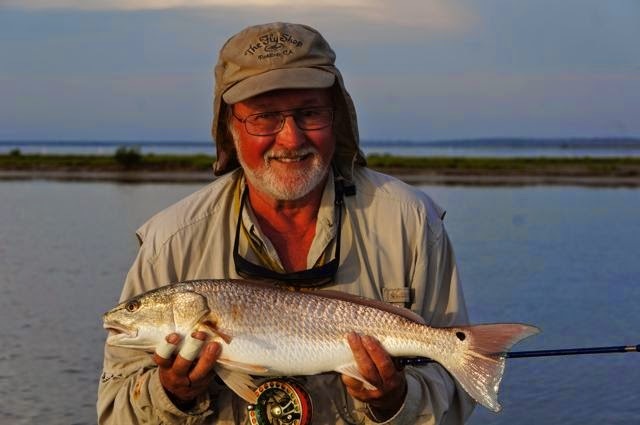 We walked over to one of my favorite places, where reds mingle with mullet along a crystal clear drop off. 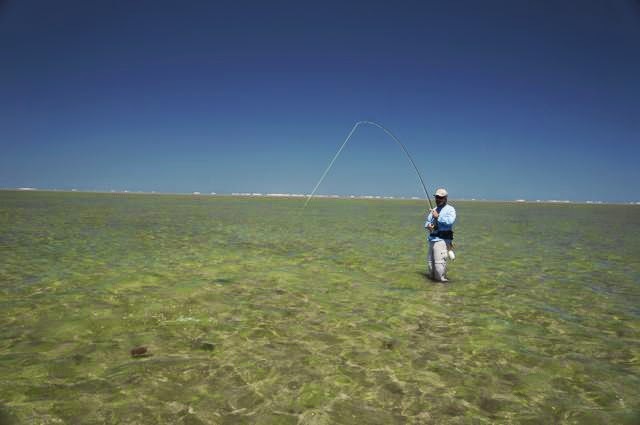 It was eye candy to watch the reds and ladyfish and mullet milling around in gem-quality water while Shaun tried to pick of the reds when they came up on the flat over the lip of the drop off. Shaun shocked three reds in the area before we packed it in, but felt he should have caught several more. Later, when heading back toward the Arroyo, I opted to check out the easternmost part of the sand, and found enough reds to justify a wade. 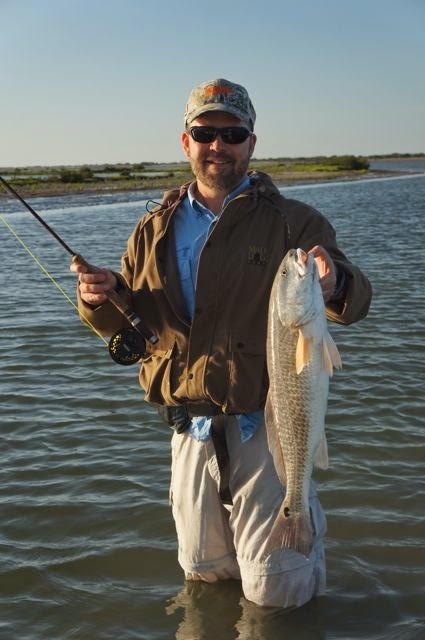 We waded for about an hour there, and landed two nice reds--one about 26"--after spotting several more. It was a great day, and Shaun will be back in July for two more. I'm sorry I left my camera at home! Stay tuned for more. I'm back from my conference in California and eager to get back on the water. I guide my old friend Shaun Daniels from Wimberly tomorrow. The forecast has improved, promising--if that's ever true--full sun and moderate wind. Saturday looks even better, and I'm open that day. If anyone wants to fish with me and my dog Rosie (she's be on the boat for good luck and moral support), email me asap at gscotspar@gmail.com. The tides have been puzzling this spring-early summer. Perhaps it was because I fished mainly during low-tide days, during which the high tide was late or during the night, but wow…the tides were low during the spring, when generally we are able to fish the skinniest back waters. Last week, during a half moon, when the tides are usually so-so, the early morning levels were very high. I gave my brother some tips from my long-distant vantage point in northern California, and the advice was worthless because the tide had jumped half a foot or more, which as you know is a huge influx of water this time of year--and not even during the new or full moon. So, give me a call at 956-367-2337 or email me if you want to grab Saturday. venue that has more in common with the Bahamas than the upper Texas coast. Randy and I guided Eric Huff and his three friends. 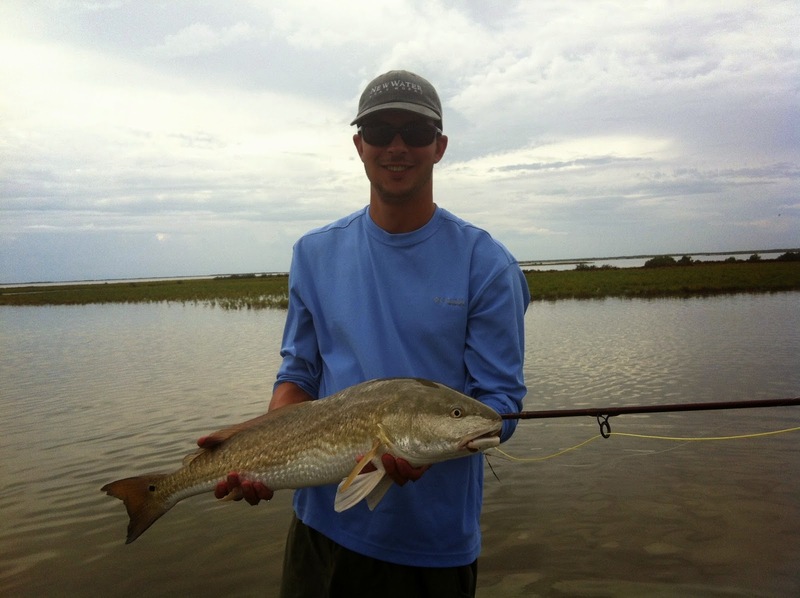 Eric is an experienced saltwater flyfisher, but he’d never flyfished the lower Laguna. We fished on two very windy days, but managed to have some good fishing. 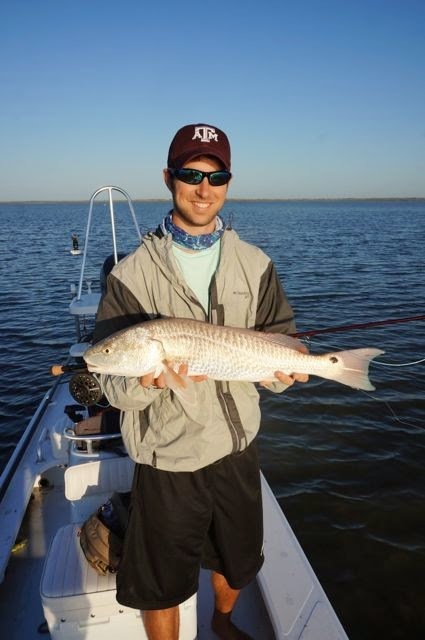 Eric started the first day landing a beautiful red that was feeding with a few others in a small pass where the current tends to attract baitfish. 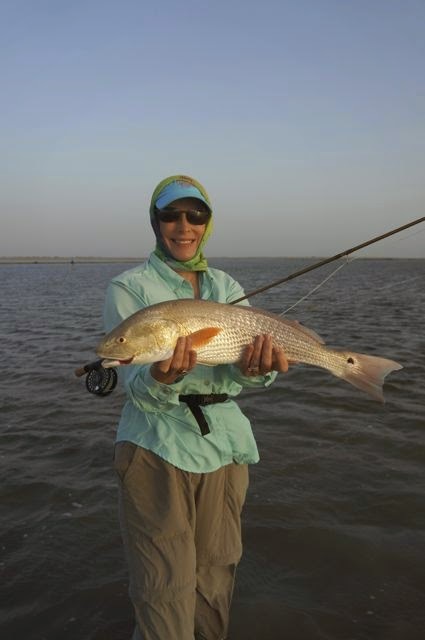 We saw them feeding, but it was terribly shallow, and I pole the Stilt over a bar separating us and the feeding reds. So Eric hoofed it over there, through knee-deep mud, and was rewarded for his efforts. We went on to fish the sand and catch a few out there each day. But it was tough flyfishing. I guided Daniel Forman and his buddy a couple of days later--two young anglers who have their own skiff and wanted to know more about the east side sand. We started on the west side, however, since the winds were pleasantly low at dawn. And wow, did we find the tailing pods! Lined up along a westside shoreline, there were pods as far as we could see. The guys had a lot of good action there before we headed east onto the sand. I introduced them to an approach to the sand that few people know about--going as far as you can east on foot in order to find single and pairs of reds feeding in virtually no water in a virtual sanctuary from boat traffic. 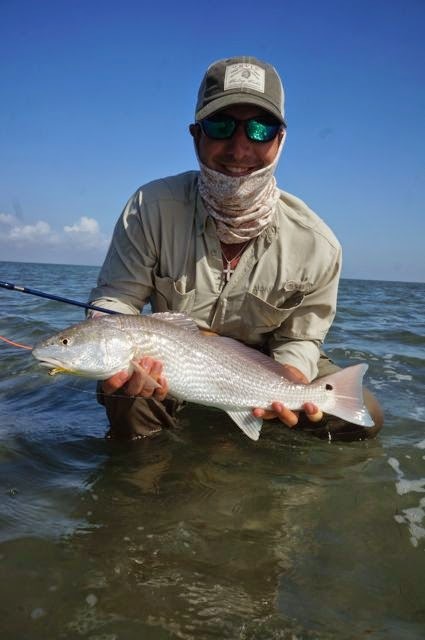 We waded there for about two hours, and didn’t find the action I’d hoped for; but the guys did encounter several reds tailing in the glassy, six-inch water. 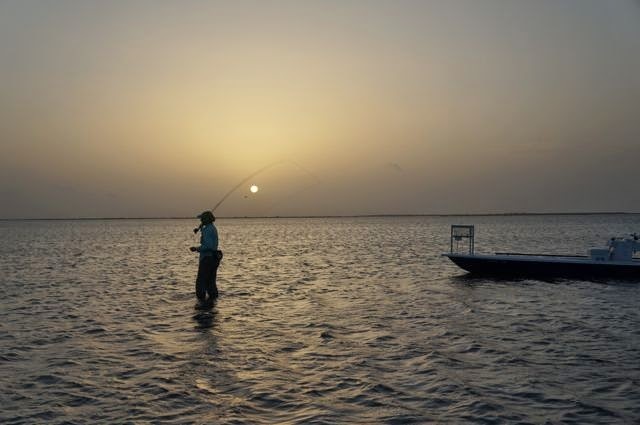 What makes this action so good is that the water remains glassy even in moderate wind; so one can spot tails at 200 yards against the early morning glare of the low sun. There’s nothing better when it’s “on,” and even when it’s not, there are usually a few good shots in the offing. On an otherwise poor day, it can offer a rare treasure. 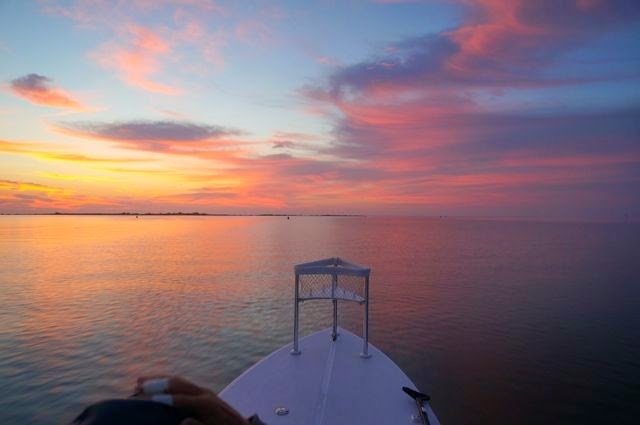 We had only one day together, but the guys learned some new things about the Bay, and I’m sure I will see them like specks on the eastern horizon, wading in a glassy expanse where the sky kisses the water without a seam between them. 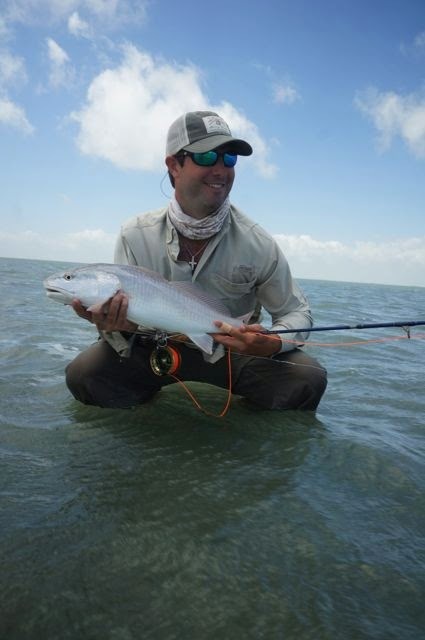 Ben Pasqual asked me to join him in guiding a group of four guys from the Houston area. I had the pleasure of guiding Chris Kelley and his son Scott, who is a young pro golfer. 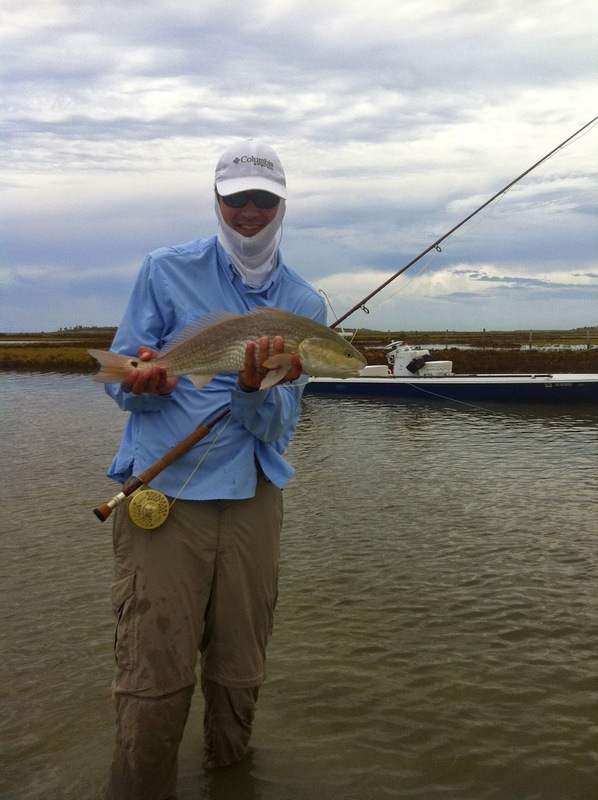 I had a great two days with the Kelleys, who had never flyfished for reds and trout. Scott did amazingly well, casting my six-weight TFO while his dad wielded his own Orvis 8-weight. 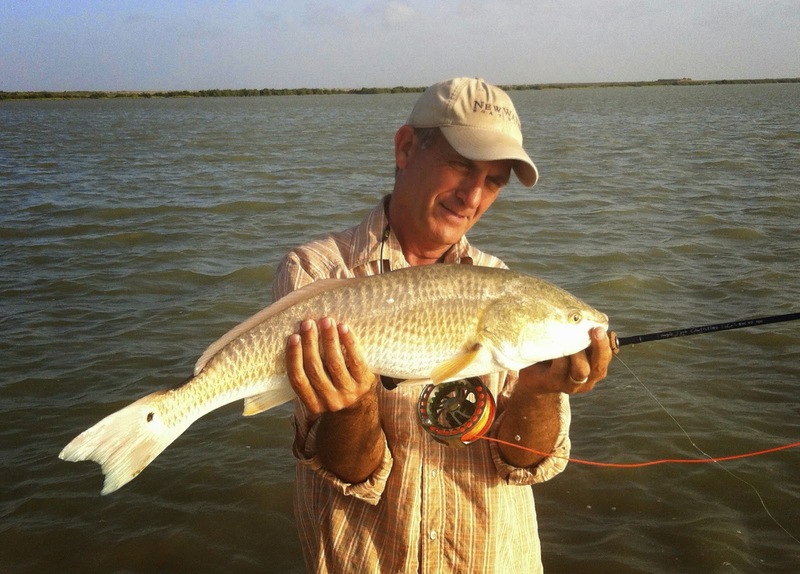 Scott is a natural athlete with great vision, so he took to the Mother Lagoon like a favorite son, hooking up on reds within minutes of our arrival to the sand around 8:30 am. I think you could have heard his victory cry in northern Mexico on his first hookup: He was ecstatic, and his dad was just about as happy to see Scott adapting to the demands of the fishery with such adeptness. In the early afternoon, the Kelleys witnessed a full “turn-on” of the sand. We arrived in a particular area that I’ve known about for several years now. I’m not sure why, but the reds often pour onto the sand in small groups around 2 pm, and begin feeding in a foot of water. It was dreamlike--almost constant action for about two hours, until the late afternoon glare shut us down. I believe Scott landed six for the day, and his dad finally broke the ice, too. At one point, a sizable red went on a high-speed run and popped the knot between the line and the backing. I was on the boat, about 200 yards away from Scott when this happened. I saw him casting, then hooking up, then suddenly running across the flat and seizing something. Later he told me that the fly line was on its way to the next county, but he was able to catch up with it just in time to bringing the red in by hand. A great day! And the next one was almost as good as the first! 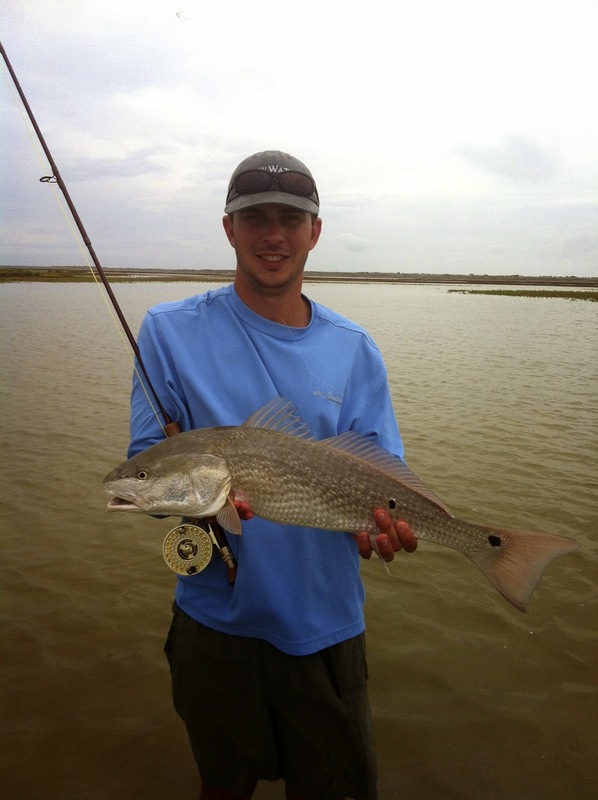 We found the reds earlier on the sand, and were able to get one shot after another from the Stilt. Both guys caught fish, and again Scott distinguished himself as a master flyfisher in the making. A few days later, I had the pleasure of guiding Bob Buchman and his buddy Rich from Washington state. 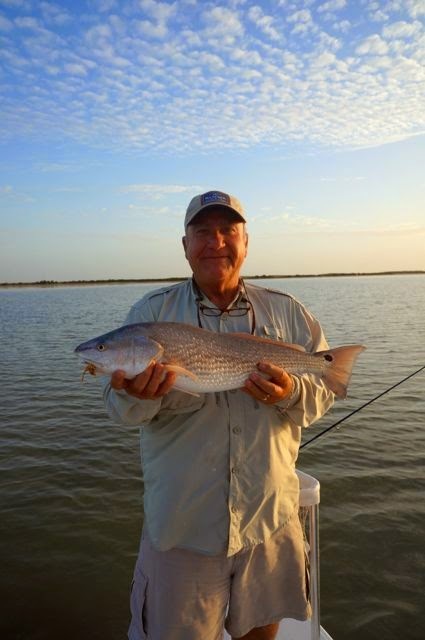 Bob had fished with me before, but Rich had never flyfished in saltwater. Similar to Scott Kelley, Rich took to it like he’d been born here. Of course, the phenomenal tailing that we found on both days made it easier, but there’s no excuse for good casting and good line management, which Rich was able to put together. 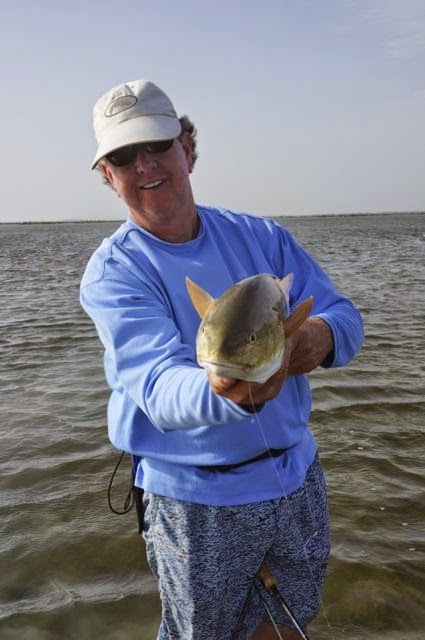 We had countless opportunities for the first four hours of each day--frolicking pods of reds feeding explosively in almost prohibitively shallow conditions. 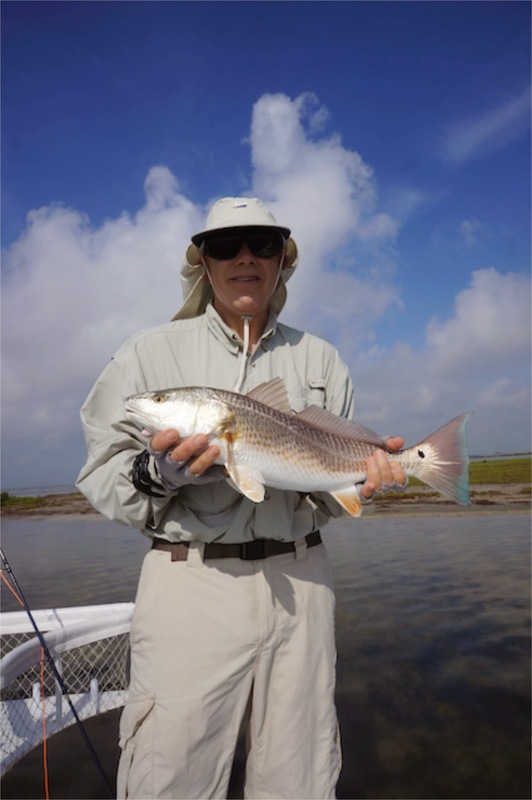 We fished from the boat for the first hour or so on day one, but then spent the rest of the day and all of the second day wading in an area that was festooned with pods of redfish. They guys were on fish almost continuously for hours. I videoed their catches to the point where my battery almost played out on day one. I look forward to having some time to edit the clips into a mouthwatering display of the best of the best flyfishing on the LLM. We also fished the sand on both days, but the winds were so low--yes, hard to believe--that the surface tension remained intact into the late afternoon. Since there were clouds on the horizon, the glassy surface reflected white cumulus clouds rather than revealing the fish beneath the surface. 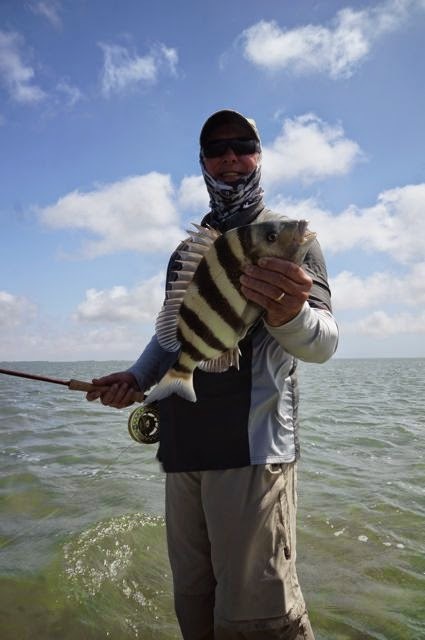 They caught a couple of fish, and then fished with Randy Cawlfield on day 3 (I had another charter) and were able to catch more fish on the sand, because the wind was stronger. Newcomers to the LLM often think that calm winds are always better; but as a rule, we only want windless conditions in the early morning. 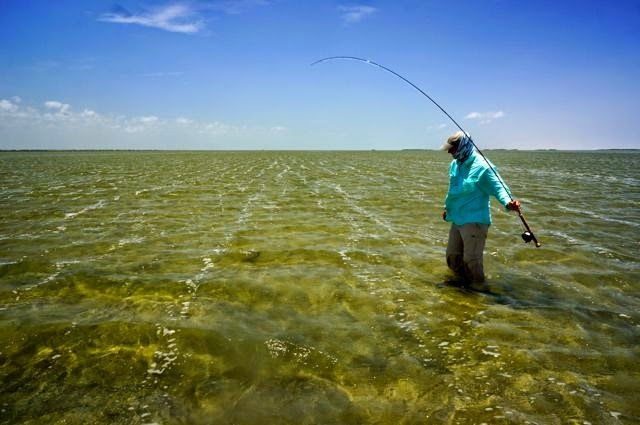 It’s usually better to have 12-20 mph winds for fishing the sand. Otherwise, the reflection of the clouds can make sightcasting on the sand very tough. While Randy took over guiding Bob and Rich on their third day, I guided Greg Schoenmann and his buddy Rick, who have fished the LLM for most of their lives, but felt that they needed to learn more about flyfishing methods and places to flyfish. So the day was a teaching day, but we also found an amazing display of tailing pods in an area that I would have bet $1000 would have been devoid of fish. It was an area that was “too shallow” to fish, but I’d discovered a slightly deeper trough in the middle of a 5-inch deep expanse of water. We waded into the area, after hearing some explosive feeding sounds, and as we got closer our eyes got bigger. Golden backs of several pods of 20-30 fish were reflecting in the low-angled sunlight. It was mesmerizing to wade slowly toward the aggressively feeding fish without another boat in sight. Well, it wasn’t a high-catching moment (Greg is still bruised from his own foot, I believe), but it was crazy fun to watch him casting upwind to those fish! On one occasion, he hooked up and the rest of the reds exploded one by one, then zipped by us, almost tripping us as they passed by. Meanwhile, Greg’s fish threaded by us, making it necessary for Rick and I to dodge the flyline. As we looked back at Greg, he was wrapped up in the line and frantically trying to clear it before the big red could snap his tippet. Alas the red was faster than Greg, and the line went limp as the final image on a rapid sequence of out-of-control moments. We all agreed that the experience was unforgettable, regardless of the outcome.